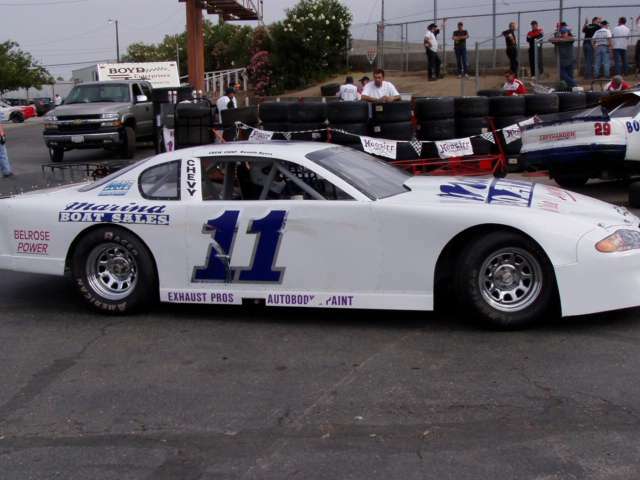 Only 62/1000th of a second in time trials kept Dave Byrd, #0, of San Jose from a clean sweep in his return to HOTWOOD Western Late Model action this week at Stockton 99 Speedway in the NASCAR Weekly Racing Series presented by DODGE and sponsored by C.L. Bryant Union 76 Gasoline. 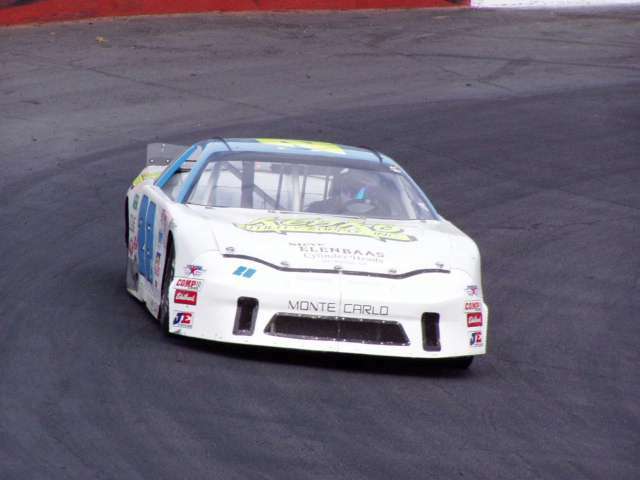 Byrd had left the track after the July 20th event when his car owner and former Stockton Late Model champ, Tim Gillit of Lathrop became embroiled in a parts issue and withdrew from competition. 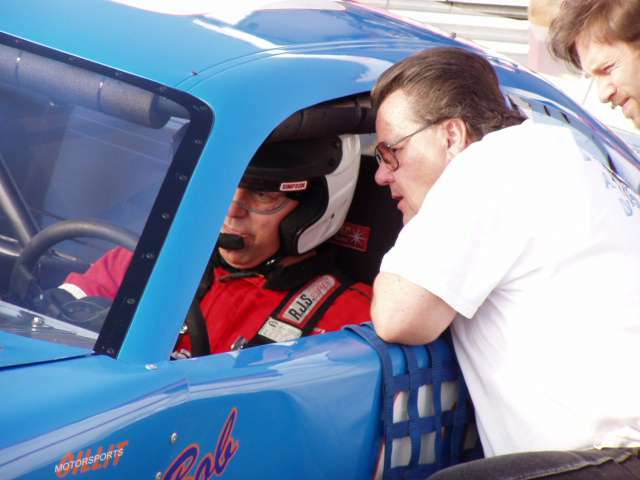 Gillit returned the car to action with Bob Strandwold of Modesto behind the wheel on 9-14 and spent two weeks bringing the already quick car to full song before Byrd stepped back in to protect his fifth-place season point standing this week in the final race of the 2002 season. 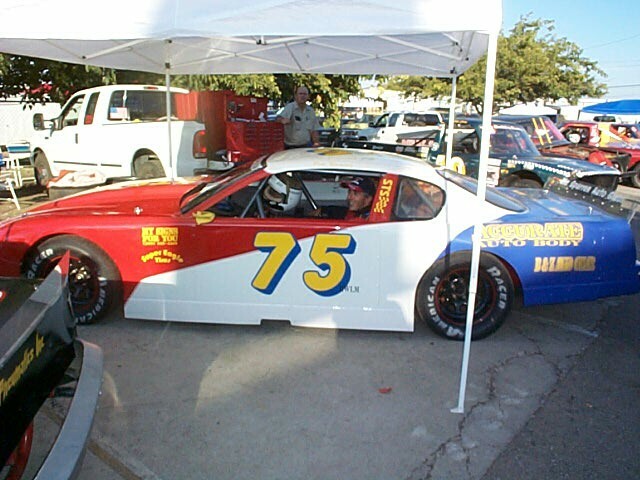 2002 season champion Harry Belletto, #74, of Modesto, set the quick time and won his heat, with Byrd, #0, running second quick and claiming his heat and the dash to set the main event drama. Byrd started 7th on the grid, one spot ahead of Belletto as Buzz Devore, #45, seated in his cockpit, of Stockton grabbed the first lap lead. Byrd was in fifth by lap four with Belletto keeping pace. On the 15th circuit Byrd took the point with Belletto slipping to second as the two pulled away to their own private battle. 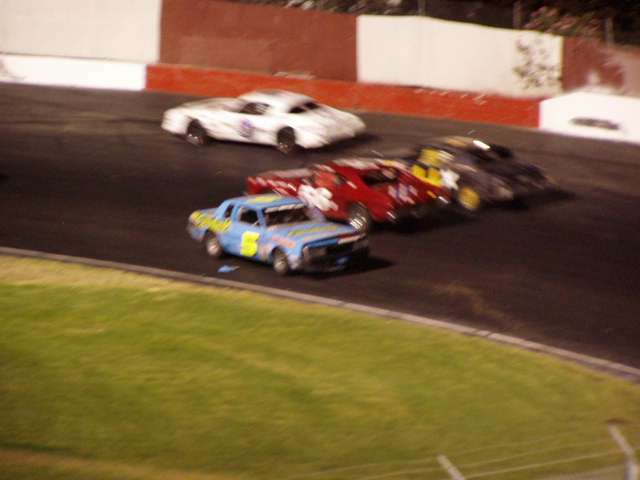 The yellow flag blues hit first on lap-20 as Johnny Berndt, #1, of Clements spun in turn two with Byrd, Belletto, Devore, Tracy Bolin, #29, of Valley Springs, and Wes Miller of Turlock making up the top five on the restart. Another yellow fell a lap later as Stockton driver Jerry Crawford, #75, wound up backwards against the front wall off turn four. Just as quick another yellow fell as Berndt made contact with Anthony Swan of Newark and Swan spun in the second corner. Miller moved to third on the next pass with yet another yellow flying on lap-24 as Devore and Robert Knittel of Lodi tangled in turn two. The top five at this point consisted of Byrd, Belletto, Miller, Bolin, and Crawford with only three laps going into the score book before the worst of the yellows came on lap-27 when Berndt took a straight-on hit into the pit exit gate concrete. Berndt spent a few moments remembering childhood Christmas presents before climbing from the car to wave at the fans. Cars scattered to the pits under the yellow for repairs with accusations and recriminations flying as to who was responsible and why and the process Belletto and Devore retired from the event. Byrd continued the final laps to score the win, his fifth of the year, ahead of Miller, Chris Monez of Lodi, #11, Crawford, and Bolin. 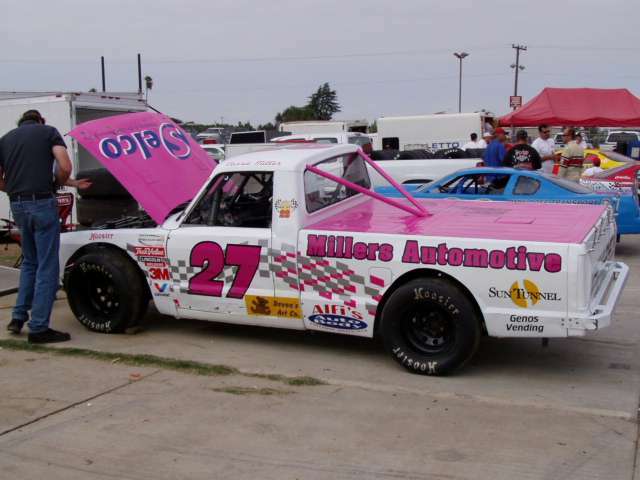 Miller, #87, ended up the season second in points behind Belletto, with Bolin running third. An absent Pete Anderson, Jr., of Stockton finished fourth in the tally with Byrd holding his spot in fifth. 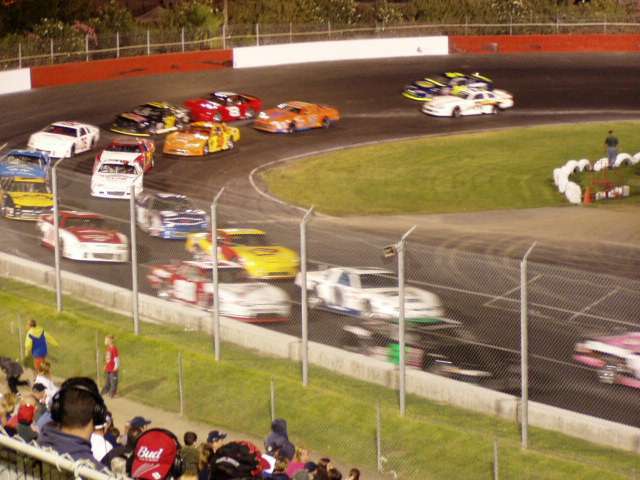 The SRL Late Model Wild West Shootout Series concluded their fourth and final event for the season with Joey Zampa, #92, of Napa putting on a perfect driving job by leading all 100-laps of action and fending off furious charges by previous Stockton winner John Gaalswyk, #28, of Ripon. Four yellows slowed the early action, but the final 25-laps were a fan-pleasing barn burner with Gaalswyk making try-after-try to get low under the steady Zampa. Gaalswyk could get the line, lap-after-lap, but Zampa had the power to hold off the charge at the next corner. Zampa took the win with dash winner Gaalswyk on his bumper, and both followed by Ron Strmiska, Jr., #90, of Manteca, Nathan Tucker, #41, of Sonora, and Chris Wadsworth of Oakley. Michael Carver of Placerville was the fast time man on the night. Incoming series champion Jeff Anthony, #76, of Livermore was out early in a 13th lap crash that broke suspension parts. Anthony got the car put back together and joined Zampa in a series of circle-burnouts on the front straight after the checkered flag. 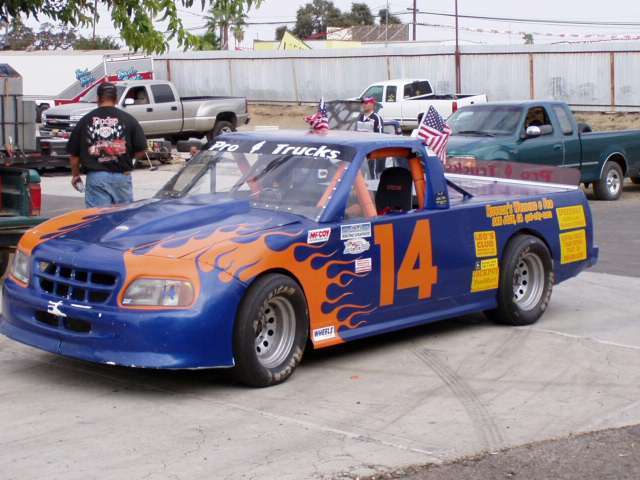 The Pro-Four Truck series produced a strong count of 20 drivers with Gary Franks, #14, of Manteca continuing to show his season dominance with a quick time on the field and a feature win by almost ¾ of a lap. Franks, started 10th on the grid and took the lead on lap seven after early leads by Todd Lewis of Riverbank and Mark Slife of Livermore. Only one quick yellow slowed the pace with Franks leading at the checkered over Rudy Marquez, #44, of Modesto, strong running Carrie Miller, #27, of Saratoga, Bret Barney, and Slife. Heat wins went to Randy Johoda of Tracy, Mike Frank of Denair, and Troy Ermish, #72, of Fremont, who also nailed the dash win. 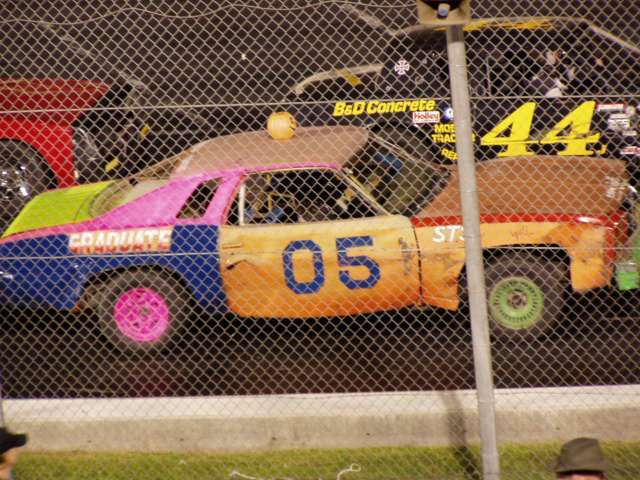 The end of the season Pure Stock Power Puff event gave the wives, Moms, and gal friends of racing the chance to strut their stuff in competition on the quarter-mile oval with Bobby McCaul of Manteca leading the first lap before bowing to last years winner Donna Jacke, #4, of Stockton. Heat and dash winner Cindy Bentz, #44, of Lodi grabbed the top spot on lap-five with Jacke taking it back a lap later and holding off Bentz to lap-12 before Bentz retook the lead for good. Geri Knittel, #10, of Lodi, the other heat winner on the night, stepped into the second spot on lap-16 and chased Bentz to the checkered. Jacke held strong for third ahead of Robin Ratcliff of Stockton, and Gina Holman, also of Stockton. Four minor yellows slowed the event with fun had by all. 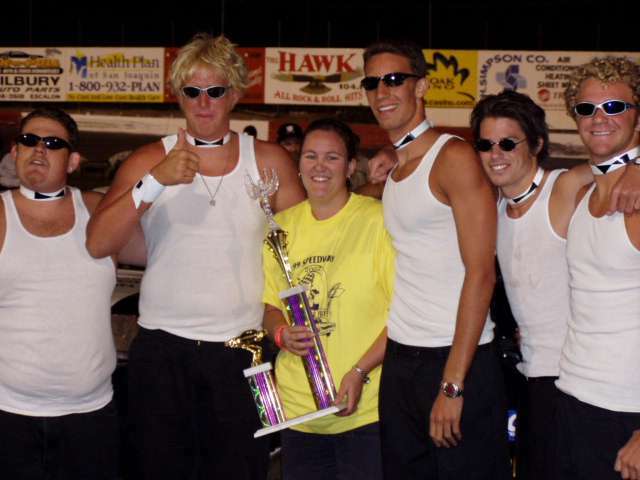 Trophy presentations were made to the ladies by 99's version of the Chippendale dancers, (Delta Water Polo Team Members, with a special guest!). 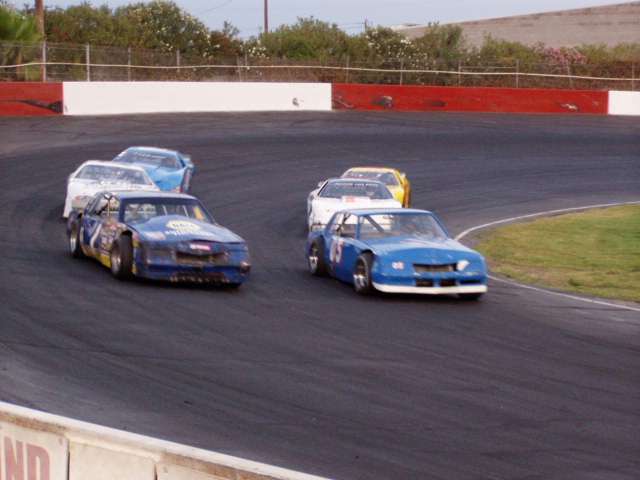 Stockton Speedway will close the 2002 season on October 5th with it’s annual 250-lap Enduro contest, running 125-laps in each direction on a wet and soapy track. 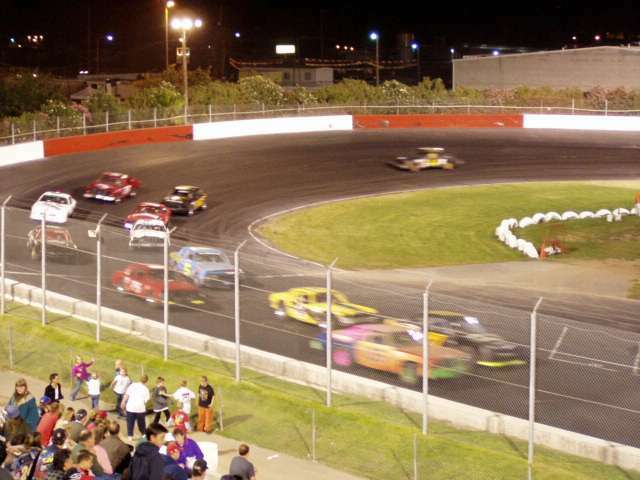 A roll over contest will add excitement to the night as will a planned five-lap "BACKWARDS" race open to a maximum of 10 cars that choose to enter after the Enduro event is over. 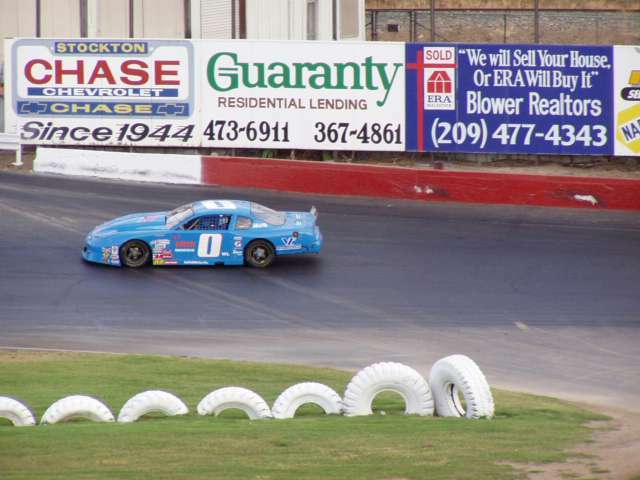 The Management and staff of Stockton Speedway sincerely thanks the many drivers, teams, and especially the fine and long list of sponsors that have made the 2002 season a great success. 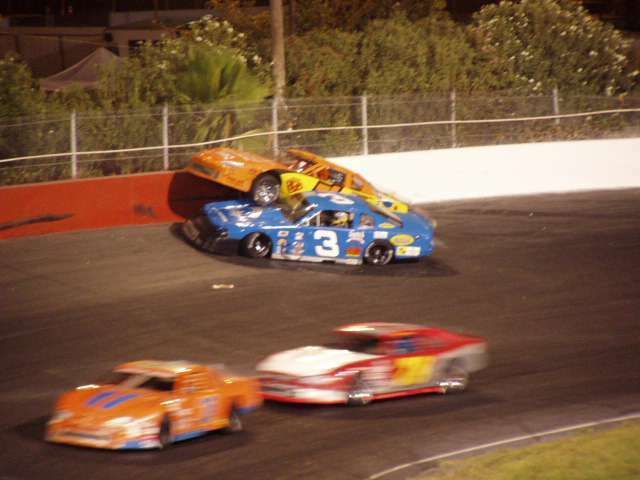 Stockton Calif. (September 29, 2002) – Davey Hamilton’s SRL Wild West Shootout returned to Stockton99 Speedway for the final event of the 2002 racing season. 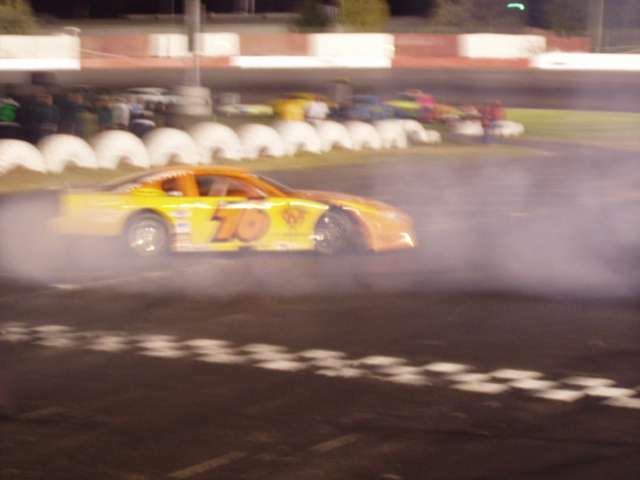 Joey Zampa of Napa California picked up his second career shootout victory. John Gaalswyk finished second behind Zampa. Ron Strmiska Jr. of Manteca finished third. 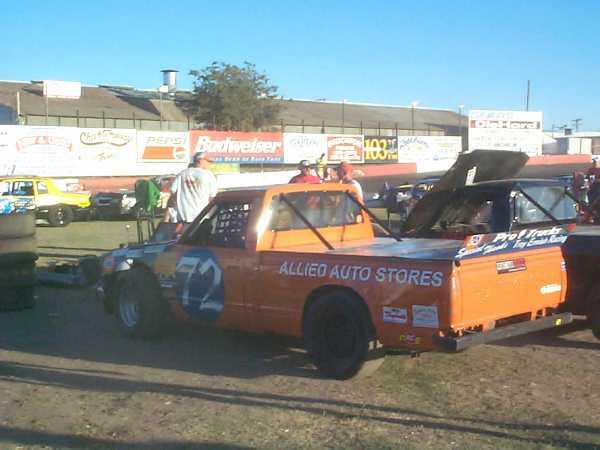 Nathan Tucker the 2001 SRL Wild West Shootout champion came in fourth, while Chris Wadsworth of Oakley finished fifth. The evening began with Michael Carver of Placerville setting fast time around the ¼ mile track. Carver turned a lap of 14.140. Strmiska was second quick with a lap of 14.174. John Gaalswyk won the trophy dash over Zampa, Strmiska, and Carver. A four-car invert would put Zampa on the pole for the 100-lap feature. Zampa took the green flag and headed into turn one with Gaalswyk a close second. Strmiska maintained the third position with Carver fourth; Wadsworth fifth as the field was slowed down for a crash in turns three and four involving the 2002 SRL Wild West Shootout champion Jeff Anthony. Anthony and Gene Garrett of Sacramento came to a stop with the front of Anthony’s car up in the air on top of Garrets. 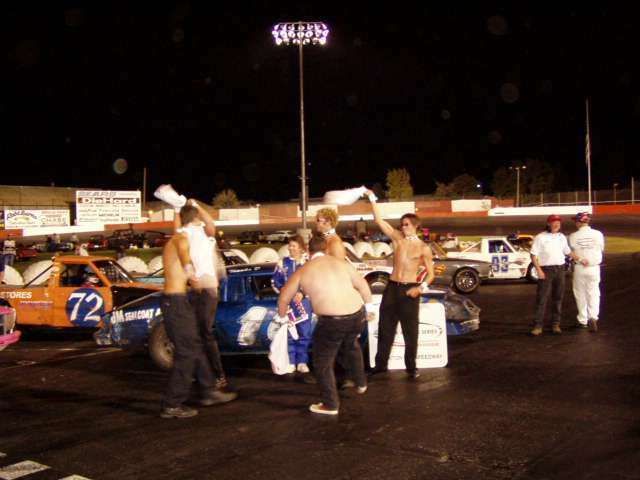 Both drivers were finished for the night, but Anthony would return after the race to celebrate his championship with donuts on the front stretch. 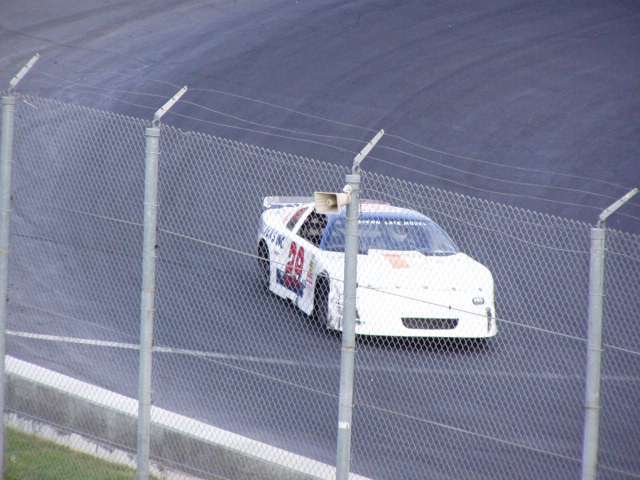 As the race went back to green, Chris Wadsworth passed Michael Carver on lap 36 for the fourth position. A lap 40 caution was brought out when Ray Lawson Jr. of Fresno spun in turn four and hit the wall. 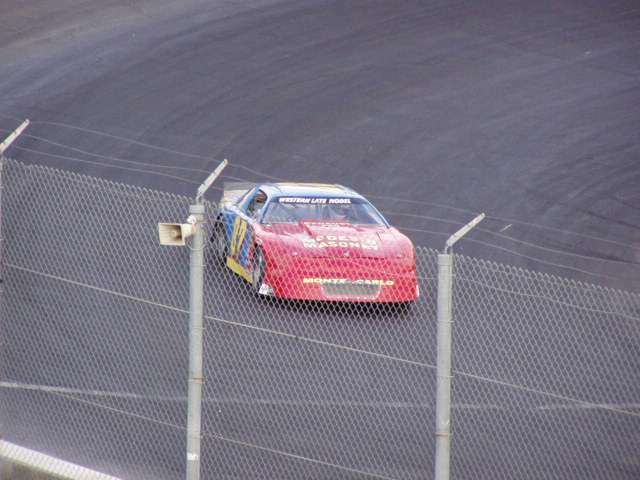 Lawson would continue and finished ninth. At the half way point John Gaalswyk started to put some serious pressure on leader Zampa until lap 56 when Scott Sanchez lost a motor and brought out a caution. Zampa was still leading with Gaalswyk in second, Strmiska third, Wadsworth fourth and Nathan Tucker fifth. Gaalswyk was putting more and more pressure on Zampa as the laps winded down. With 15 laps to go the leaders caught up to lap traffic, but Zampa passed every car with Gaalswyk right behind him trying to make a move for the top position. Zampa held on to take his second victory of the season. “My car started going away with about 20 laps to go, I was getting a little nervous,” said Zampa in Victory lane. “Gaalswyk raced me real clean, it was a great race, and good way to finish off the year”. 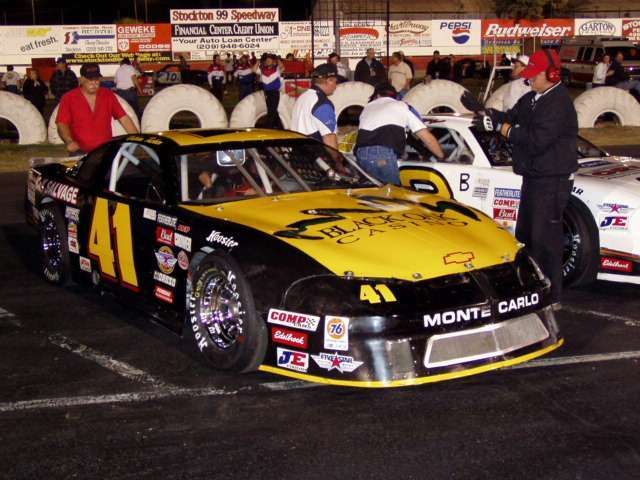 Carver would go on to finish in the sixth position, 2001 Rookie of the year Tim Stratmeyer finished seventh, with Ed Coughenour eight. Raw Lawson Jr. finished ninth, as Wes Banks rounding out the top ten. Consistency was the key to the championship for Jeff Anthony. 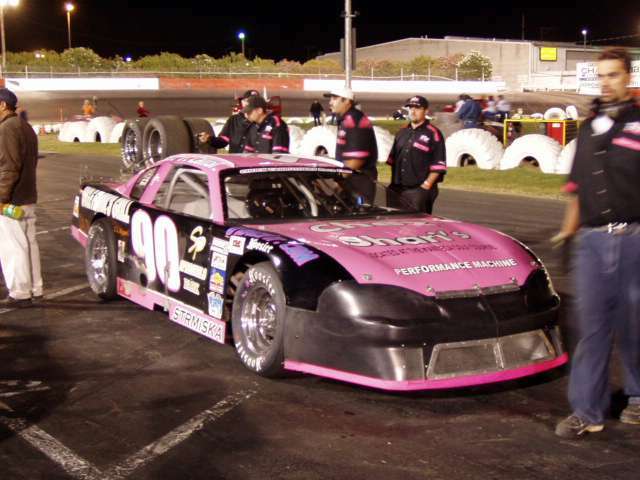 Before the race at Stockton99 Speedway, Anthony posted ten top ten finishes in a row before finishing a disappointing last. “It feels good to win the championship, this was a great thing to accomplish, I have a real good crew” said Anthony the 2002 season champion. 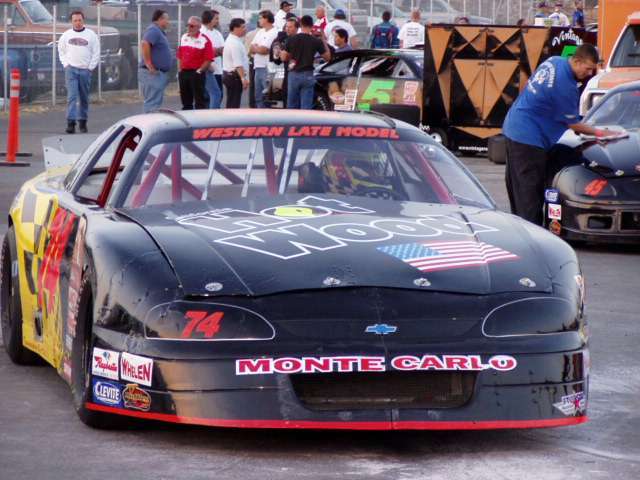 With Nathan Tucker’s fourth place finish he was able to move into second in the final standings for the 2002 season. 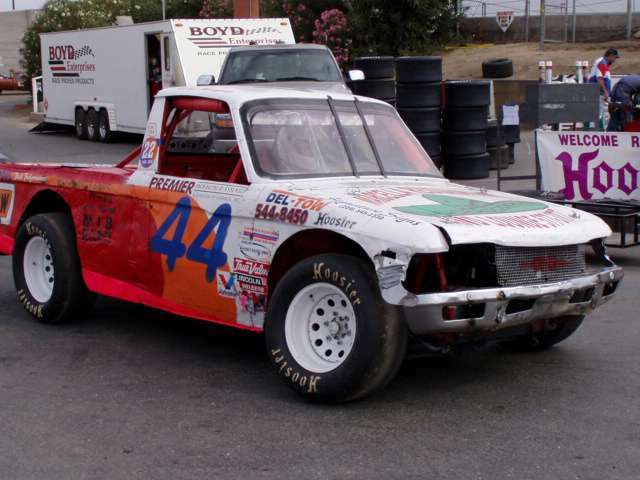 Raw Lawson Jr. a two-time winner this year finished third. 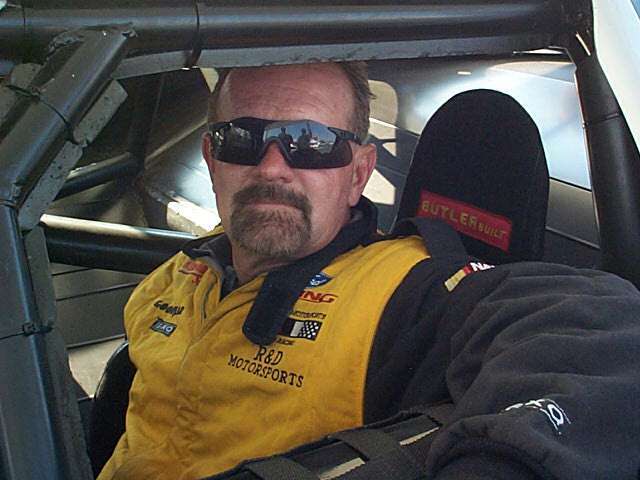 Rick Ruzbarsky finished fourth, and also was awarded the 2002 SRL Wild West Shootout Rookie of the year. 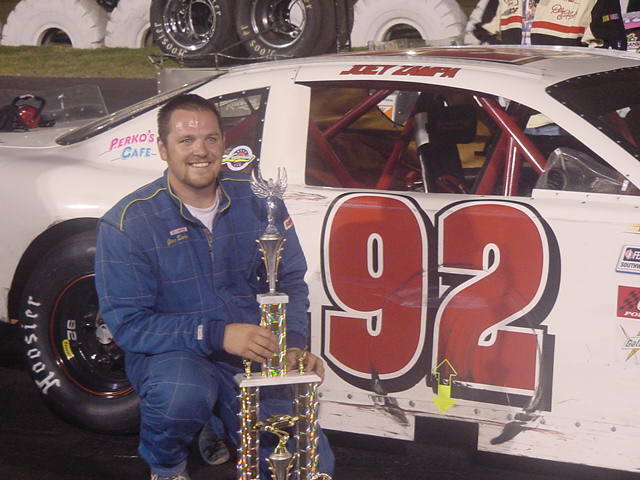 Race winner Joey Zampa finished fifth in the season standings. Davey Hamilton’s SRL Wild West Shootout would like to thank it’s 2002 Series sponsors which include: Sunoco, Hoosier, Western Seed & Fuel, Extreme Race Wear, Five Star Stock Car Bodies, Frank's Radio Service, F. R. E, & Print Works.